80th day of the year (81st in leap years) with 285 days to follow. 1928 Charles Lindbergh is presented the Medal of Honor by President Coolidge for his first trans-Atlantic flight. 1952 Alan Freed presents the Moondog Coronation Ball, the first rock and roll concert, in Cleveland, Ohio. 1963 Alcatraz, a federal penitentiary on an island in San Francisco Bay, closes (see trivia). 1965 NASA launches Ranger 9 which is the last in a series of unmanned lunar space probes. 1965 Martin Luther King Jr. leads 3,200 people on the start of the third and finally successful civil rights march from Selma to Montgomery, Alabama. 1970 The first Earth Day proclamation is issued by San Francisco Mayor Joseph Alioto. 1970 Vinko Bogataj crashes during a ski-jumping championship in Germany; his image becomes that of the “agony of defeat guy” in the opening credits of ABC’s Wide World of Sports. 1980 US President Jimmy Carter announces a United States boycott of the 1980 Summer Olympics in Moscow to protest the Soviet Invasion of Afghanistan. 1999 Bertrand Piccard and Brian Jones become the first to circumnavigate the Earth in a hot air balloon. 2006 Social media site Twitter is founded. ~ Out of my mind. Back in five minutes. ~ A clear conscience is usually the sign of a bad memory. ~ As long as there are tests, there will be prayer in public schools. ~ Laugh alone and the world thinks you’re an idiot. ~ Sometimes I wake up grumpy; other times I let her sleep. ~ The severity of the itch is inversely proportional to the ability to reach it. ~ You can’t have everything; where would you put it? “I’ll sleep on it,” said Joan. six months later the doctor met Joan on the street. “He told me to cut the legs off the bed! A snail bought himself a snazzy fast car but took it in to get a more eye catching color. At the car paint shop, he asked that the car be painted neon yellow and have a large red ‘S’ printed on each side. “I’ve circled this block for 10 years. If I don’t give you a ticket, I’ll lose my job. “Balance?” inquired Michael, still confused. God explained, pointing to different parts of earth. New Orleans lawyer sought an FHA loan for a client. He was told the loan would be granted if he could prove satisfactory title to a parcel of property being offered as collateral. The title to the property dated back to 1803, which took the Lawyer three months to track down. “Your letter regarding title in Case No. 189156 has been received. I note that you wish to have title extended further than the 194 years covered by the present application. I was unaware that any educated person in this country, particularly those working in the property area, would not know that Louisiana was purchased, by the U.S., from France in 1803, the year of origin identified in our application. For the edification of uninformed FHA bureaucrats, the title to the land prior to U.S. ownership was obtained from France, which had acquired it by Right of Conquest from Spain. The land came into the possession of Spain by Right of Discovery made in the year 1492 by a sea captain named Christopher Columbus, who had been granted the privilege of seeking a new route to India by the Spanish monarch, Isabella. The good queen, Isabella, being pious woman and almost as careful about titles as the FHA, took the precaution of securing the blessing of the Pope before she sold her jewels to finance Columbus’ expedition. Now the Pope, as I’m sure you may know, is the emissary of Jesus Christ, the Son of God, and God, it is commonly accepted, created this world. Therefore, I believe it is safe to presume that God also made that part of the world called Louisiana. God, therefore, would be the owner of origin and His origins date back, to before the beginning of time, the world as we know it AND the FHA. I hope you at the FHA find God’s original claim to be satisfactory. 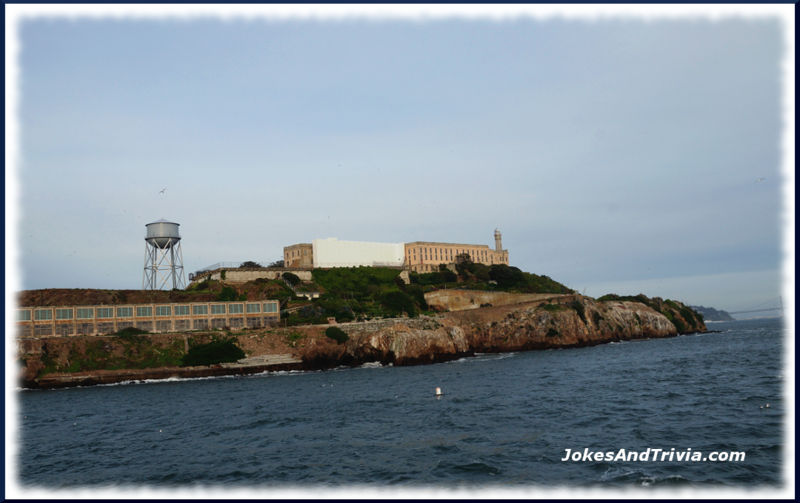 TODAY IN TRIVIA: How many wardens did Alcatraz Prison have? There were four: James A. Johnston (1934–48), Edwin B. Swope (1948–55), Paul J. Madigan (1955–61), and Olin G. Blackwell (1961–63). 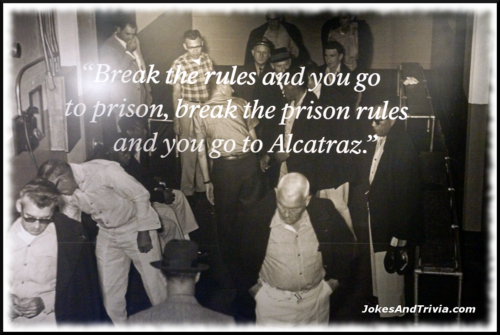 ~ When was Alcatraz Prison in operation? Alcatraz was in use as a prison from August 11, 1934, until March 21, 1963. ~ What was the main purpose of Alcatraz? Alcatraz was designed to hold prisoners who continuously caused trouble at other federal prisons. ~ How many prisoners were at Alcatraz? Over the years, Alcatraz had some 1,576 of America’s most ruthless criminals including Al Capone, Robert Franklin Stroud (the “Birdman of Alcatraz”), George “Machine Gun” Kelly, Bumpy Johnson, Rafael Cancel Miranda, Mickey Cohen, Arthur R. “Doc” Barker, Whitey Bulger, and Alvin “Creepy” Karpis.